Since August of 1953 Camp Barstow has hosted a small herd of Bull Moose because urbanization of their natural habitat was threatening the population. The herd has survived through the move from the old camp in Gaston, SC and now enjoys the lush vegetation on the banks of Lake Murray. In 1957 the Royal Order of the Bull Moose was formed in order to help protect and nourish the herd of Bull Moose. 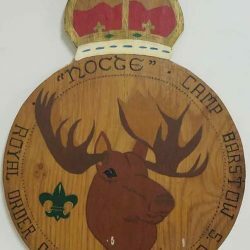 To be inducted a Scout must make significant contributions toward the preservation of the Bull Moose at Camp Barstow. Alternatively the Scout can take part in the weekly Bull Moose hike on Wednesday night at camp to join. The induction ceremony is performed during the Friday night campfire prior to the OA call-out. For many years Scouts and staff at Camp Barstow have shared the camp with our illusive herd. Sightings are rare but Scouts do often find tracks, droppings, and munched vegetation. We encourage Scouts to keep a sharp eye out as pictures of the Bull Moose are rare.